We know that lesbian, gay, bisexual, transgender, and queer (LGBTQ) Coloradans face greater health disparities than their non-LGBTQ peers, but very little data is collected on it. It’s time to change that. The 2018 LGBTQ health survey asks about healthcare, insurance coverage, and mental and behavioral health, as well as some more in-depth questions about seeking care as a transgender person. 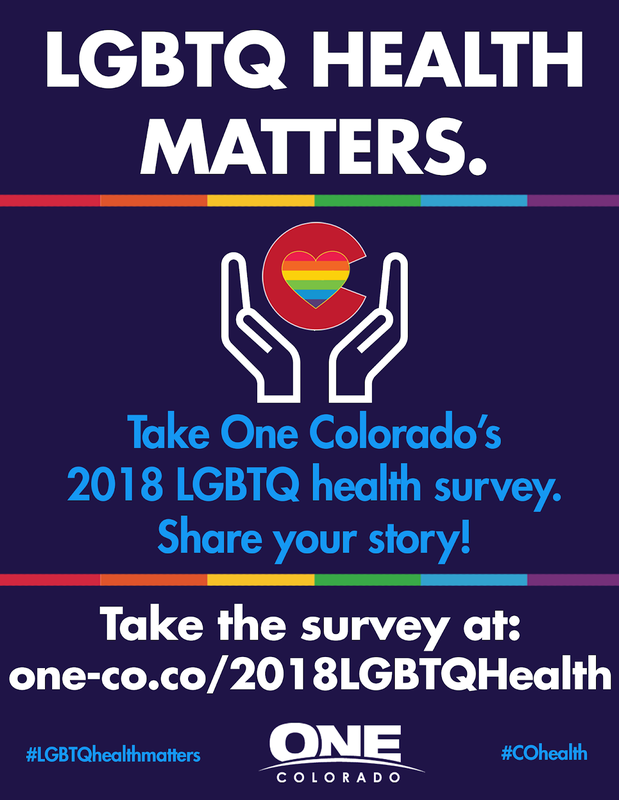 The information from the survey, which will take about 20 minutes to complete, will give us a clearer picture of the barriers that LGBTQ Coloradans experience when accessing care. Participants can be entered to win a $25 gift card, is they elect and give their information to do so. By taking the 2018 LGBTQ health survey, you can tell your story and help break down barriers to healthcare for LGBTQ people. 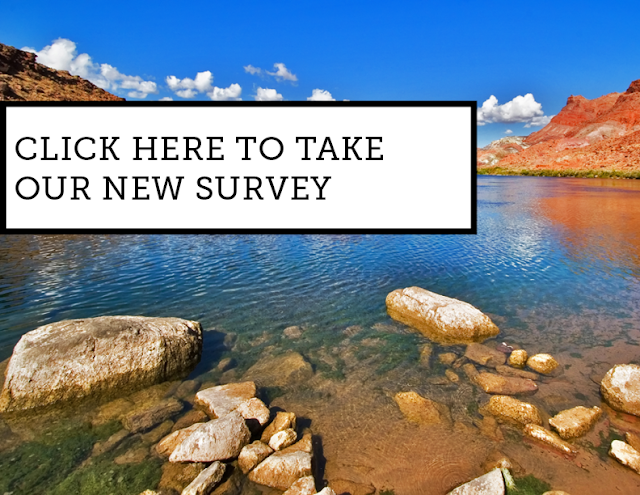 Click here to take the survey. This survey was initially created in 2011 by One Colorado Education Fund and its partners, and so much has changed since then because of what we learned - including the Affordable Care Act, Medicaid expansion, and achieving non-discrimination protections based on sexual orientation and transgender status in Colorado insurance plans. It’s time to update what we know about LGBTQ health here in Colorado, so we can tell lawmakers and healthcare providers what needs to change. The Children’s Safety Network (CSN) is launching the first cohort of a new Child Safety Learning Collaborative to reduce fatal and serious injuries among infants, children, and adolescents through the implementation and spread of evidence-based strategies. The first cohort will begin in November 2018 and continue for 18 months to April 2020. 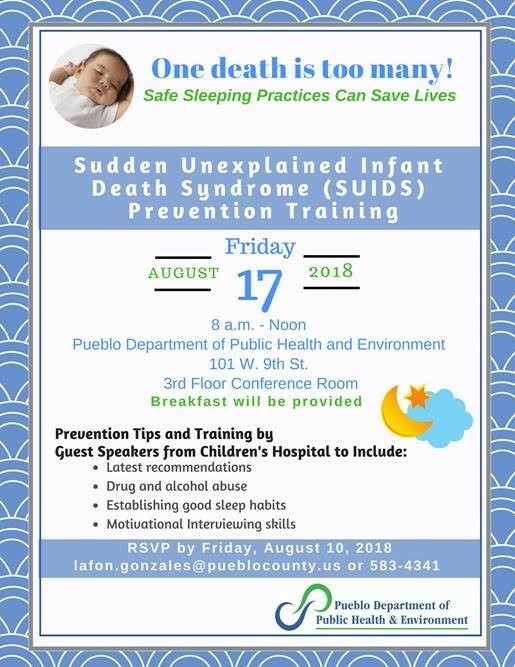 It will focus on five injury topic areas: (1) bullying prevention, (2) motor vehicle safety (includes child passenger safety and teen driver/passenger safety), (3) poisoning prevention (includes the prevention of prescription medication misuse/abuse), (4) sudden unexpected infant death (SUID) prevention, and (5) suicide and self-harm prevention. CSN invites all interested state and jurisdictional Title V agencies to apply for this new Learning Collaborative. As Title V agencies must be the lead applicant, we encourage non-profits, researchers and other organizations to attend the informational webinar and then reach out to their state/jurisdiction Title V leadership to explore partnering on an application. To learn more about the Collaborative and how to apply, join us for a short informative presentation either Thursday, August 2nd at 2:00 p.m. ET / 1:00 p.m. CT / 12:00 p.m. MT /11:00 a.m. PT or Tuesday, August 7th at 3:00 p.m. ET / 2:00 p.m. CT / 1:00 p.m. MT / 12:00 p.m. PT. These sessions will cover the application process, review the team expectations for participation, and provide an opportunity to answer any questions. Space is limited, so please register now! ﻿Please note that we are unable to provide CEUs or certificates for our webinars. This project is supported by the Health Resources and Services Administration (HRSA) of the U.S. Department of Health and Human Services (HHS) under the Child and Adolescent Injury and Violence Prevention Resource Centers Cooperative Agreement (U49MC28422) for $1,000,000. This information or content and conclusions are those of the author and should not be construed as the official position or policy of, nor should any endorsements be inferred by HRSA, HHS or the U.S. Government. "Family-friendly policies can take many different forms - they can be specific to an organization, such as paid parental leave, or pieces of legislation that apply to all residents. 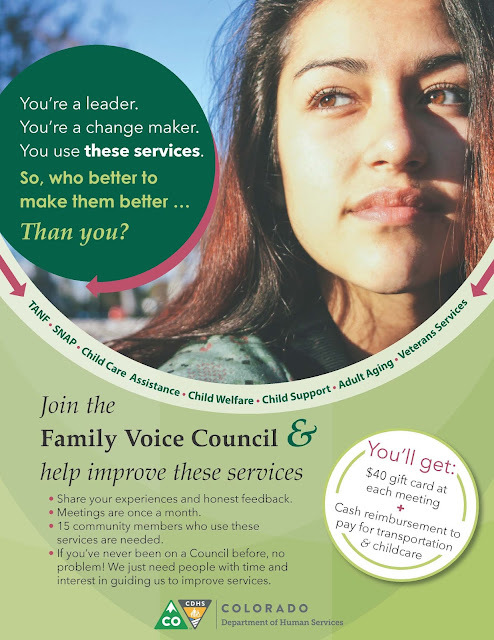 Prioritizing family-friendly policies and initiatives are important for improving childhood outcomes, decreasing stress among working parents, and enhancing overall well being within communities. This report highlights just a few of the many local-level family-friendly policies and initiatives throughout Colorado. 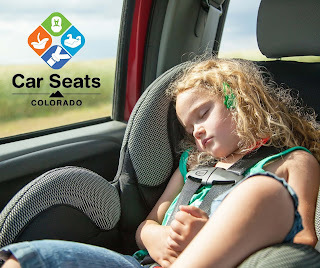 By focusing on a diverse range of projects, spanning from informal community efforts to specific ordinances, this report is meant to serve as a resource for other communities in Colorado trying to prioritize family-friendly efforts." Close Date: Announcement will remain open until July 25, 2018, or when an adequate pool is identified (i.e., minimum of 30 qualified candidates), whichever comes first. The purpose of this position is to provide strategic oversight, direction and execution of youth substance abuse prevention grants to local communities across Colorado. This position will include responsibility for key prevention program implementation, including: fidelity to the Communities That Care model, effective analysis of and implementation support for community-level primary prevention strategies, professional expertise in addressing substance abuse prevention using a shared risk and protective factor approach, expertise in applying prevention strategies to improve health equity, and integration of program evaluation across funded sites. This position is responsible for contributing to progress and fiscal status reports that will be provided to the department leadership and state legislature. This position provides supervision to two full time, permanent professional positions. This position provides oversight for technical assistance to local programs and the development and implementation of evaluation plans for prevention programming and to monitor fidelity to the Communities That Care model. This position requires strong strategic and program planning, supervisory, technical writing, and leadership skills. This position will be responsible for building and maintaining relationships internally and statewide with diverse and varied stakeholders. This position requires strong verbal and written communication skills, as it is responsible for authoring local data reports, and building and maintaining relationships in the substance abuse prevention community at the local, state and national levels. Share with your family, friends and professional networks! Do you or someone you know have ideas about what changes could be made at the Colorado Department of Human Services (CDHS)? 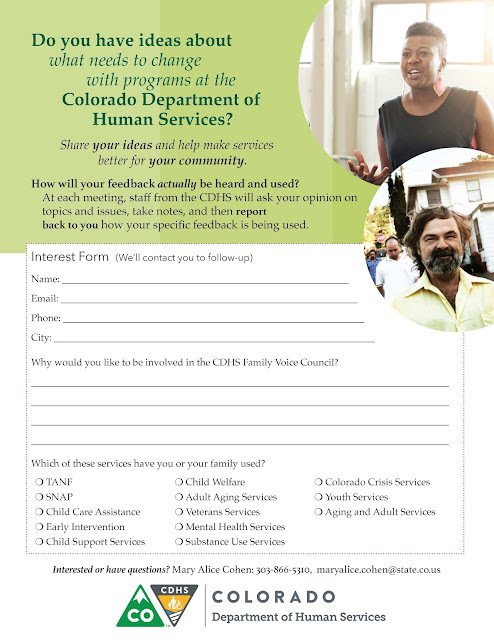 CDHS is forming a Family Voice Council to get honest, direct feedback from program recipients on how services can be improved. The council will be comprised of 15 members who receive (or have received in the past) two or more of the following CDHS services: TANF, SNAP, CCAP, Early Intervention, Child Support, Child Welfare, Colorado Community Response, Home Visiting, Veterans Services, Mental Health Services, Substance Use Services, Colorado Crisis Services, Youth Services or Aging and Adult Services. The council will meet once a month and members will serve a 12-month term with an option for serving an additional year. Council members will be reimbursed for transportation, child care or respite care, and for their time. Food will be provided at the meetings. 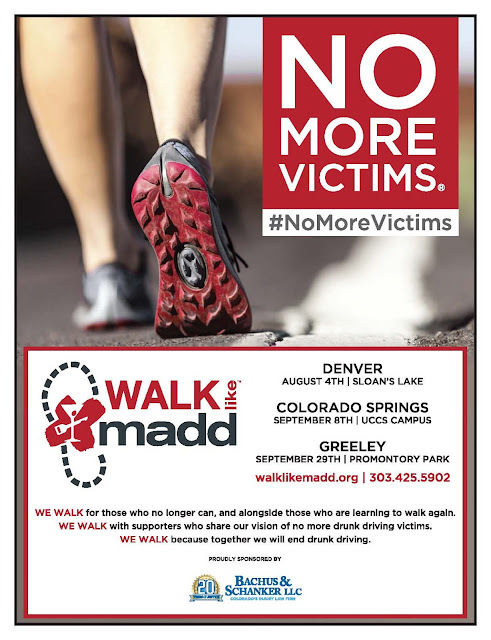 The monthly meetings will be held at CDHS in downtown Denver. Dates and times will be determined by the selected council members. Interviewing and selecting council members will begin in July and August, and the council will convene the first meeting in September. September and October meetings will be only for council members so they can develop the governance structure. CDHS staff will begin attending the council meetings in November to discuss pressing topics. IMPORTANT: Fill out the interest form here. Why Do Adolescents Attempt Suicide? Suicide among teenagers is infrequent. However, teens have a relatively higher rate of suicide attempts than adults. 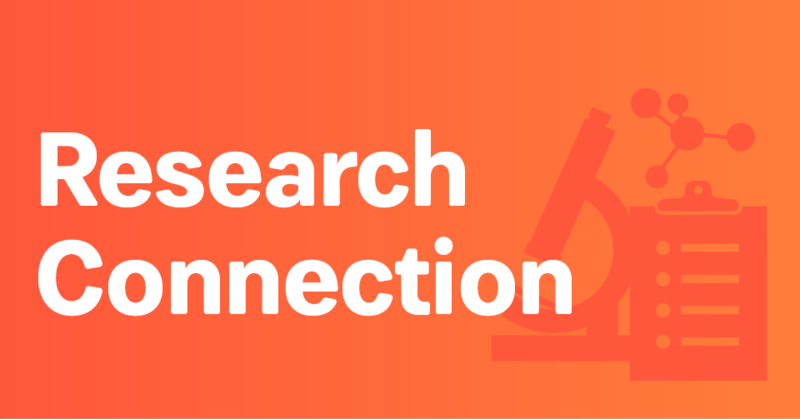 Much of suicide research is concerned with who attempts suicide rather than why they do so. 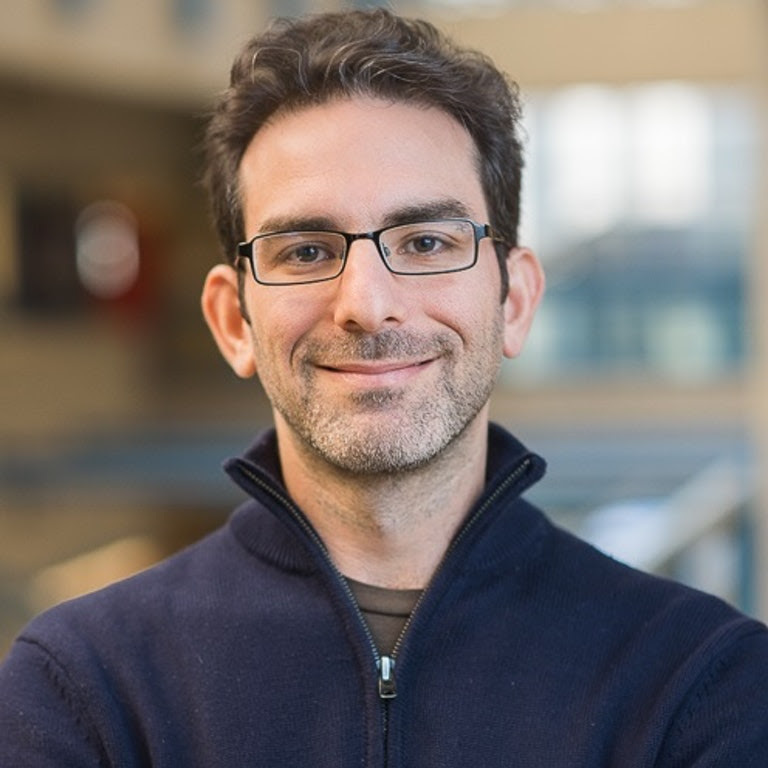 For both researchers and clinicians to gain a better understanding of what contributes to an individual’s suicide attempt, Dr. David Klonsky of the University of British Columbia developed the Inventory of Motivations for Suicide Attempts (IMSA), based on several widely accepted theories of suicide. In the present study, Dr. Klonsky utilized the IMSA to assess suicide attempt motivations of 52 adolescents ages 12-17 years (mean age 14.8 years) who were hospitalized at a psychiatric inpatient unit after a suicide attempt. Copyright © 2018 American Foundation for Suicide Prevention, All rights reserved. The Violence and Injury - Mental Health Promotion Branch at Colorado Department of Public Health and Environment facilitates the Violence and Injury Prevention Blog, the Young Drivers Alliance Blog, and the Colorado Child Fatality Prevention System Blog. We’re currently working on making improvements to the sites. We want to hear from you about how we’re doing! In particular, we want to know what forms of communication work best and provide the most useful information for you. Please answer the questions in our survey with that in mind to help us get a better sense of your communication needs, and how we can improve the way we update you. We’d also love to be able to reach back out to you to follow-up on your response! If you feel comfortable, please fill in your name and email! Check out the new Health eMoms introductory video! The Child Fatality Prevention System is pleased to announce the release of the Child Fatality Prevention System 2018 Annual Legislative Report! The report includes an overview of the system, data on violence and injury-related deaths among youth ages 0-17 in Colorado, and seven prioritized child fatality prevention recommendations (see below) as well as updates on past system prevention recommendations. Over 70% of Black/African American adolescents with a major depressive episode did not receive treatment for their condition. Almost 25% of adolescents with a major depressive episode in the last year were Hispanic/Latino. Asian American adults were less likely to use mental health services than any other racial/ethnic groups. In the past year, nearly 1 in 10 American Indian or Alaska Native young adults had serious thoughts of suicide. In the past year, 1 in 7 Native Hawaiian and Pacific Islander adults had a diagnosable mental illness. Despite advances in health equity, disparities in mental health care persist. The Agency for Healthcare Research and Quality (AHRQ) reports that racial and ethnic minority groups in the U.S. are less likely to have access to mental health services, less likely to use community mental health services, more likely to use emergency departments, and more likely to receive lower quality care. Poor mental health care access and quality contribute to poor mental health outcomes, including suicide, among racial and ethnic minority populations. The HHS Office of Minority Health encourages all our partners to educate their community about the importance of improving access to mental health care and treatment and to help break down other barriers such as negative perceptions about mental illness. Visit this web page during National Minority Mental Health Awareness Month 2018 for downloadable materials, events and health resources. Minorities are less likely to receive diagnosis and treatment for their mental illness, have less access to mental health services and often receive a poorer quality of mental health care. Register now for this interactive webinar to learn about the latest research on bullying among children and adolescents and explore strategies for using social and emotional learning (SEL) to prevent bullying. Social and emotional learning helps children and adolescents to manage their emotions, empathize with others, and develop positive relationships. (1) It provides an important framework for schools to use in helping students acquire and strengthen social and emotional skills to prevent bullying behaviors and support inclusion and respect. (2) Catherine Bradshaw, Ph.D., M.Ed. of the University of Virginia, Tracy Waasdorp, Ph.D., M.Ed of the Children’s Hospital of Philadelphia and the Johns Hopkins Bloomberg School of Public Health, and Michael Sulkowski, Ph.D. of the University of Arizona will describe their research and practice in applying social and emotional learning to the prevention of bullying. The webinar will be moderated by Jim Vetter, Ed.M. of Education Development Center (EDC) and the Social-Emotional Learning Alliance for Massachusetts (SEL4MA).